Been a while since updating, all looks good on Sine timeline.... Still on track for low on/about Jan20th. Purple is the wave short pattern. SineTC says price will be at significant low, and below the wave starting point at end of Timecycle. Depending on wave duration, most price drops are over 20% from staring point. The cycles are not the Red/Green visible sine wave , the Cycle is the timeline difference between the apex of the two waves. Each wave is at different frequency. Thus you have waves at different length, from a few days to few months. Direction of wave (up/down) has no barring on this study. The wave is used as a timeline, and the offset is the length of cycle. I expect we will run up (20th) Monday morning US on opening.. I expect this run will hold below 53.25 on the 1hr, but regardless of price I plan to short as soon as I have confirmation Monday afternoon or Tuesday AM. For now our target is 40 by Jan 20th. We are currently short oil . See linked for more info. I'm always suspicious when things follow the plan too closely.. We are not the only people who see this pattern, right or wrong could depend on others goal to break the pattern , not to predict it... I seldom trade until 30min after US open. I tend to see H&S patterns everywhere.. so I don't trade them on their own, but this one plays right into my SineTS, and may look pretty obvious to many.. anyway fits my trade plan to add short around 52.2x, near or after 2pm rollover. Although Trumps final vote/confirmation should be know by 16:00 EDT, so last push could be tomorrow? Hopefully that last bump will be reasonable.. if this thing spikes at open to 53.x, I would not be surprised.. this is when the machines start hunting weak stops.. aka: "Crystal balls"
Good Luck.. Protect those balls! Trade active: Added shorts at 53.1x . This should be my last trade of the year. If we would really crash or sky rocket (unlikely).. I might move sooner. But Jan 20 at 46-48 is the current target..
Over 100% short.. for now. Comment: Looking for something like this.. Still 100% short.. last weeks EIA was the first bearish report (build over forecast) since November. There were 3 bear reports in November. They were followed by an average 4-6% price drop in next 3 days. Last week's bear build was followed by 3% price drop. It was also a small bear (+2.26). A bear build over +3M, should knock the price hard and break the flag. Updated 4hr Heiken.. down channel confirmed. We could see a retrace to 51.57 in the channel trend, my guess is, if it happens, it will be tomorrow.. then dump after EIA. But that is a guess. We are 100% short with Target near 48... for now. Trade active: Updated of my daily trade screen. I feel like we are in the groove..
Trade active: Sill active.. but yesterday completed wave study and confirmed study accurate (this cycle). That is 8 cycles in a row! So a curious thing happened today, as I have said before. My intention was to be out of my shorts today. But here I am, Short and Happy. 2. Study says Price will be below starting price at peek of Bull wave jan 19/20-2017. 3. Historically the price will drop about 20% lower than starting price during cycle.. sometimes twice. 4. Price may rise above starting price, but will be below start price at end of cycle. Oil can continue to drop, but will show a short term spike/trend on bull wave peak (about 1-20-2017). That is the basic rules.. there or some other info like average fall and such.. but these rules should no be broken if study is valid. In addition there is a mini bull wave (no related) due on 20th. (Purple). So far everything has been on plan.. an still is. Study was confirmed at yesterday's close. In addition, we have already seen one drop from wave start of 20%. This looks like wave 2, hence Title. My plan was to exit last night before the mini-bull wave, using it as timing to the end of Bear Sine. Which it did. So study proven correct. But I'm still short. I have also found that the average down wave this cycle has been 25days down. This has occurred 4 times in a row. Using this 25 day timecycle.. that would put bottom on 27th, not 20th. That would fit 100% into study as well. So what happened that was curious yesterday? Well if we look at today's move (at rollover) we see the spike that was due today from the unrelated mini-wave.. and it doesn't appear to be the big reversal I thought it would trigger. So I'm holding my shorts and looking to next Friday as the possible bottom of wave. Look what happened with Trump election, oil initially tanked, only to recover and tank lower a week later. When we started this wave most were bullish, now we have many more bears, a mini short squeeze on trump inaugural might just be the like Election Day. With the real fireworks coming a week later.. but will cover if that doesn't happen. Will see soon... still short. I'm also including new cycle and my daily TA chart, which shows we are in the middle of channel, and typically oil doesn't see a reversal here. (Again showing Jan 27th as good low date, and at channel bottom on this chart as well. And news velocity cycle.. they worked much harder to get to top of channel this cycle.. ragged. Up & down, but cycle is obvious. Somethings got to give. DOW, DXY, Trump.. push, push, push. 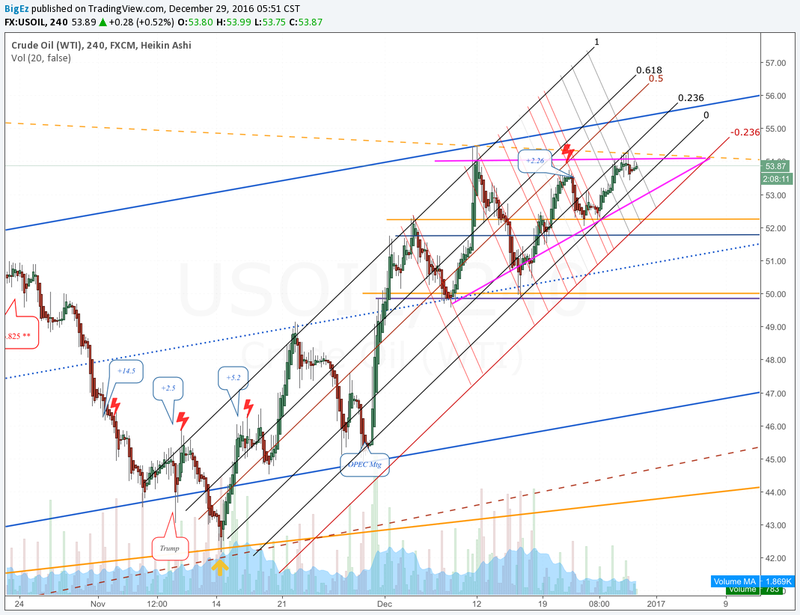 Will the above three push WTI higher? Or is this crew just propping up the price for now. When the wedge breaks we will know. Trump could tweet my fate.. but I think for now fundamentals get some respect and this thing dies.. we will see. BigEz, can we get a big low around start of July? Weekly bearish momentum still has lots of juice. @5898928, on a 2 week timeframe you should be ok. I'm short till 48'ish for now. This is just a corrective Wave C, until 21-22 of Dec. Target zone 48.50 - 49.20.